Learning a new language as an adult can be a very challenging experience, but it can also be rewarding. Living in Los Angeles, hearing Spanish is very common, but most people who speak Spanish also speak at least a little English. Trying to learn Spanish here is difficult I usually end up taking the path of least resistance speaking English. So, how was I to learn this new language? By being immersed in it. I travelled to Costa Rica to attend an immersion class last December. For two weeks I attended Spanish classes for four hours a day. I spent half the time learning the grammar and vocabulary, and the other half conversing with my instructor. 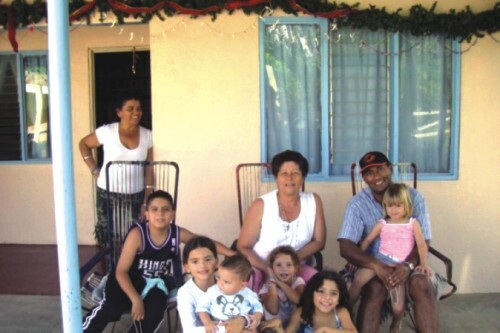 The institute I attended “Forester Instituto Internacional” in San Jose, Costa Rica (http://www.fores.com) put me up with a family who spoke only Spanish. I was put in a situation where I had to speak Spanish - out of necessity, for communication and social reasons. 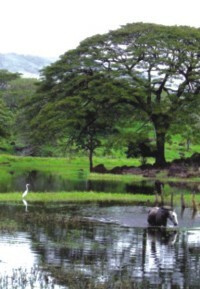 The idyllic beauty of Guanacaste. People from Costa Rica are called “Ticas”. And my Mama Tica (Costa Rican guardian) Vianney was a wonderful lady, extremely hospitable and an excellent cook! In fact I didn't realise how lucky I was she was also a cooking instructor. Needless to say, I ate very well every day. One of the typical foods of Costa Rica is called “Gallo Pinto”. It is usually prepared for breakfast rice and beans mixed together and served with scrambled eggs. Very simple, yet tasty and filling. Costa Rica is the only country in the world without a military. Its people for the most part are very pleasant and peaceful. I think the way a nation's government acts has an effect on the mindset of the general population. So traveling around Costa Rica was a joy. People were happy to talk to me everywhere and I was able to practice my Spanish without hesitation. One thing I realised was that people didn't really care about whether I spoke correctly. The only thing that mattered was that I got my point across. It made for a comfortable environment to speak and practice. Ticas have a saying “Pura Vida”. Translated it means “pure life”. It kind of means “take it easy” or “life is good”. It's a greeting that expresses a relaxed mindset. I would be spending Eid in Costa Rica I was a little apprehensive since I didn't want to miss Eid prayers. I had found some information on where to go for prayers from the internet. It turns out San Jose, Costa Rica has a Muslim Cultural Center. The secretary at the institute, Stephanie called the center and got the address, directions and time for Eid prayers for me. To my surprise and delight, after prayers, I met three Bangladeshis! It was a treat. One was a student at the University for Peace and the other two worked in shops in San Jose. Eid festivities were in full swing and I enjoyed Eid lunch and the company of a very international crowd. Christmas was around the corner too, and my host Vianney and her family were going up to her village La Fortuna in the province of Guanacaste for a couple of days. I was invited to join them. This was a rare opportunity to be a part of village life in Costa Rica and I embraced it. 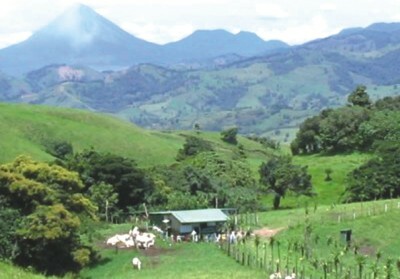 Guanacaste is about four hours north of San Jose. As I was woken up at 3am to get ready, I was wondering why I had signed up for this, but as we approached the green forests of Guanacaste and took in the fresh scent of country air, I was happy I was there. As we approached the town of La Fortuna, I couldn't contain my excitement. Butterflies were fluttering everywhere and we passed a large pond with a wild horse drinking from it and in the distance was a large waterfall, so far way that you couldn't hear it. Nature was the dominant element here and everything was beautiful, tranquil and breathtaking. I spent the next couple of days enjoying the “Aguas Calientes” (hot waters) of the thermal springs and enjoying the company of Vianney's hospitable relatives. The little grandchildren were fascinated by the presence of an “extranjero” (foreigner) and they proudly displayed their ability to count in English and translate all the colors from Spanish to English! I too joined in and the kid inside me showed off my newly acquired Spanish skills! 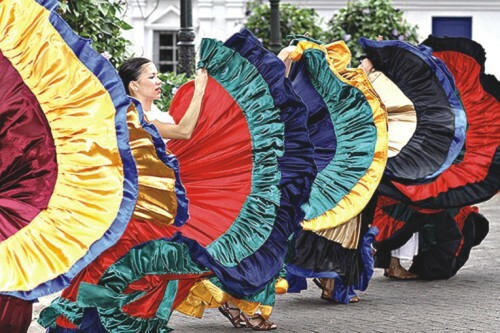 Dancing, the costa Rican way! So did I learn a lot of Spanish? I have to answer yes. But above all, learning Spanish has opened a door to a beautiful culture. I have learned so much about the people of Costa Rica their culture, their food, their beliefs. I am back at home now and I realise that sometimes speaking a foreign language can be the path of least resistance. It expresses solidarity with, acceptance and understanding of a culture different from one's own. With Vianney (centre) and her family. Nabeel Atique is an Associate Professor of Mathematics at Antelope Valley College in Los Angeles County. He is an avid mountaineer and has climbed in the Alps, Andes, Africa, Asia, Cascades and Rockies.